In an exclusive interview with Cricket PNG, HEBOU PNG Barramundis Head Coach, Dipak Patel opens up to on the recently completed ICC Inter-Continental Cup (I-Cup) and three T20 Internationals (T20Is) against Ireland, the best Associate cricket country in the world. Going into the series were you confident in causing an upset against the number 1 ranked Associate Country? Going into the Ireland games we hadn’t had enough four day cricket preparation in hindsight. However, I was comfortable about competing well against Ireland, we were well aware that we had to play at our very best over the four days to beat them. What were your overall thoughts on the I-CUP Fixture? The I-Cup fixture against Ireland was played in excellent sprit of the game, very competitive and I was very impressed with high skill levels displayed by both teams. The pitch was ideally prepared for four day cricket, bowlers got good bounce, movement and the batsman had to work hard for their runs on even placed wicket. The outfield was outstanding, it was like playing on a carpet and batsman got good values for their shots. Ireland’s extra experience in playing four day was the difference between the two teams. The ground facilities was excellent and equal any international ground, the ground staff matched the facilities, very professional and meticulous in their duties. The Townsville Cricket administrators were equally proficient and both teams agreed we were well looked after. Who impressed you from the HEBOU PNG Barramundis in the I-Cup? Assad Vala, increased his batting status at the International level. He continues to display high class quality, where he has now scored two centuries and three fifty plus score against the top three ranked teams, Netherlands, Afghanistan and Ireland. 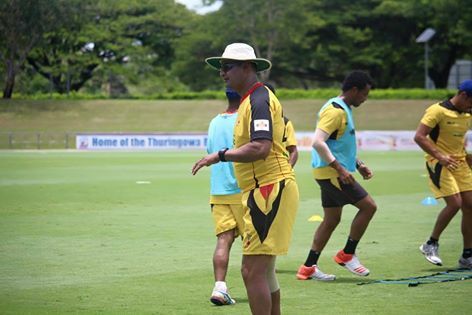 Norman Vanua, once again was the standout in the bowling department. He has taken on the responsibility of leading the bowling group, it’s a great achievement for someone so young and in-experienced. What was the difference between the two teams in the I-Cup? As mentioned previously, Ireland players are well accustomed in playing four day cricket, they have 9 players on full time English County Cricket contracts. They have the cricket and tactical awareness to sustain the pressure over the four days. HEBOU PNG Barramundis playing only their third four day cricket game, have also come a long way. But, we didn’t take the critical chances in the field when we had them under pressure in both innings. What areas do you think we need to improve on against the next four (4) I-Cup opponents? The batsman need to bat longer periods and construct more large partnerships, we must score 400 plus runs in the 1st innings and back up in the 2nd innings. The bowlers also must remain more patient and stick with the bowling plans. To win outright and gain maximum points, we must take 20 wickets to set up the game. In the field, take every chance offered and make the 50/50 chances count in our favour. Going into the T20Is, you must have been confident after the HEBOU PNG Barramundis defeated Ireland in the 2015 ICC WT20 Qualifiers last year? Yes we were, but we also recognised that Ireland would be more prepared after the T20 qualifiers. We should have won the series, but once again we couldn’t convert the winning positions we created. Our middle order batting failed to stay composed when the game was there to be won. What happened in the first two (2) T20Is? Batting, we didn’t use the batting power plays too well, losing too many early wickets. We also failed to bat to a game plan, the middle order giving away cheap wicket to their spinners. Bowling, we were consistent enough, both pace and spin bowlers gave away too boundaries at crucial times. Our strength is the fielding; however we didn’t take our opportunities when presented. The boys bounced back strongly in the third T20I. What was the difference in that game? We performed very close to our potential in all our skill sets, plus tactically we were little more precise than Ireland. We felt we were 15 runs short of a defendable target, we made up this up by bowling smartly and the standout was our fielding. In the field we took most the chances created and saved a lot of runs with our ground fielding which created the pressure we wanted to impose on Ireland. Overall, was the tour a success? The HEBOU PNG Barramundis felt we needed to get points to stay in the hunt with leading group and we failed in achieving our goal. However, it was a success in that we improved from round two of the I-Cup, we had certain skill sets we targeted to improve. So that was very encouraging, but we were disappointed we didn’t manage to convert an opportunity of an outright result. Although you were able to play/practice on first class facilities in Townsville, you and the boys must be disappointed that this fixture could not have been played here in Port Moresby? The players were extremely disappointed in many ways, they are crying out to play international cricket at home in front their family, friends and cricket supporters. The local climate and ground conditions would have given us a huge edge over Ireland. Where now to the HEBOU PNG Barramundis? The negatives, we don’t play again for two to three months. We lose the advantage of momentum of playing four day cricket and the continuity in our development. The positives are the players get a well deserved break from training and playing. They had a lot cricket since July, 2015 and this allow us time to work hard and plan on the areas we’ve identified to improve on before the next assignment.